The bouldering at Arkansas’s Horseshoe Canyon Ranch was featured in Dosage III in a memorable piece culminating with Chris Sharma’s FA of Witness The Fitness. This footage is presumably what lured the likes of Ethan Pringle, Ty Landman and Dave Graham to the woods of Arkansas. Graham’s trips to HCR and the surrounding areas featured in the recently released Dosage V were highly productive yielding 2 V14s, 5 V13s and 8 V12s; the majority of which were First Ascents. Given these two high profile pieces on Arkansas bouldering, it was only a matter of time before other strong climbers decided to stop to check things out. Enter young Daniel Woods, who recently made his first trip to HCR with typical results: the 2nd ascents of Dave Graham’s Wood Grain Grippin’ (V14) and Chunk Up The Deuce (V13), and the FA of a traverse on the Bloody Knuckles boulder called Welcome to Fightclub (V13). For good measure he also repeated Anti-hero (V13), One Inch Pinch (V12), Fred’s Roof (V11 flash) and added Starbust Assis (V11) and Wrong Turn (V9 or 10). It looks like Mr. “Tag Your Fist In The Camera” Chad Greedy was on hand to likely film Daniel’s sends as well as clean projects for him. As always, I will update you once (if?) the footage is posted somewhere. Haven’t read anything about either of those problems since they were seen in Dosage III. The mono one is understandable but Full Package is a bit confusing. Perhaps it is either a) really really hard or b) on private land of some sort? 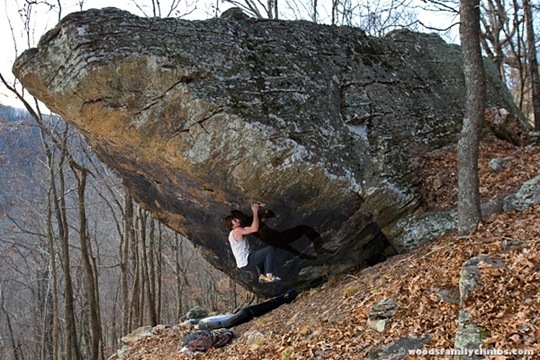 The Mono problem is called “forbidden fruit” and has an estimated grade of v10. Both this and full package are on private property. i thought ty sent wood grain grippin. i think in dossage 5 there is a clip toward the beginning of the dose of ty doing the last 2 moves…him going out right handed doing some campus thing and giving a “rock fist” of excitement to him self but i may be wrong…idk but check it out its at the beginning of the dose in this montage of clips. The all knowing 8a scorecard indicates no send. The clip must have been just trying those moves and not a send. LOVE the fist pump mid-onearm. I will be training all winter in an effort to duplicate such a feat. I’m pretty sure that was dave in the first clip, on the FA. There was that, as well as Ty monkey-ing around shortly thereafter. Looked like the same problem. idk ty did comment about not posting on 8a anymore that moonclimbing would be his official place of record but that was later after the movie,he could have started this before announcing publicly though ,but yeah he just maybe trying the moves…or sending…how knows? Not to be too big a stalker, but Landman only recently stopped updating his card. Dosage V was filmed in early 2008. In addition, Chad Greedy was likely present for most of Landman’s attempts as well as most of Woods’s attempts so Daniel would most likely know if his ascent was the 2nd ascent or not.